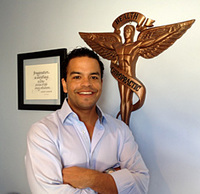 Dr. Andrew Bosier was born and raised near Ocala, Florida. In his junior year of high school he participated in a mentor program and was introduced to chiropractic for the first time. Dr. Andrew treats patients of all ages and believes that chiropractic care should be a family affair. He uses instrument adjusting when necessary or requested but prefers a hands on approach. Dr. Andrew practices with the understanding that every individual is different and must be treated accordingly. He believes the ability to listen is a doctor’s greatest tool and natural is the best medicine. He is knowledgeable in many areas and enjoys public speaking on the topics of health and wellness, exercise, and nutrition. Dr. Andrew’s other interests include family beach days on Sunday, Gator football and fishing, to name a few.